La population de l’Europe: plus vieille, moins nombreuse et moins productive? 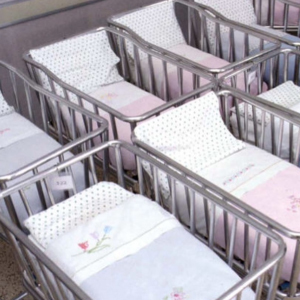 Europe’s population is bound to shrink before 2050: according to the latest revision (2015, medium variant) of the UN (2015) projections, it will decline by 4.5% (31 million) between 2015 and 2050. This overall decrease would be of little consequence were it not for the fact that the population over 70 will increase by 65%, while the population below that age declines by 14%. And this forecast is based on relatively optimistic assumptions, namely a slight upturn in fertility (1.6 to 1.8 children per woman), a 5-year increase in life expectancy, and net immigration of a million people per year. 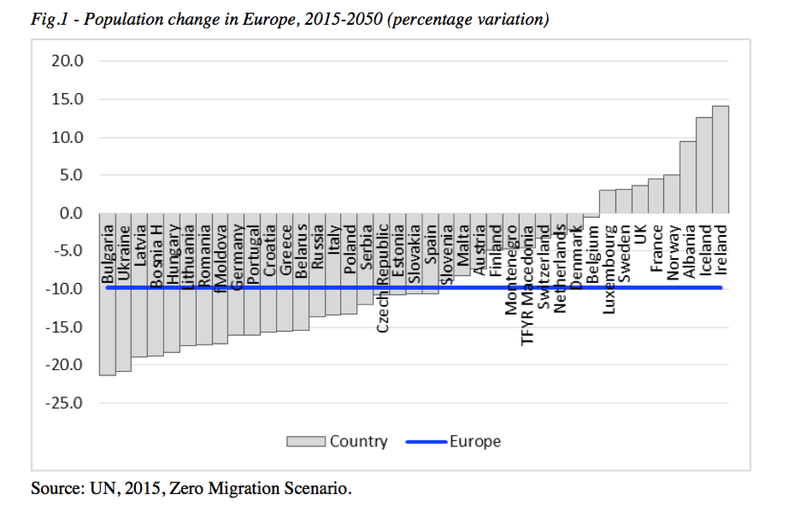 Under a zero-migration scenario (and with the same fertility and mortality pattern as the medium variant), in 2050 there would be 73 million fewer Europeans than in 2015 (-10%; Figure 1). This is a scenario that many countries would welcome and are striving to attain by means of increasingly restrictive policies. Among the largest countries, Russia, Italy, Spain, and Poland would see a decline of 11-13%, Germany 16% and Ukraine 21%, while the populations of France and the United Kingdom would increase by 4%. Almost 80 years ago, John Maynard Keynes (1937) in his Galton Lecture before the Eugenic Society affirmed that “the first result to prosperity of a change-over from an increasing to a declining population may be very disastrous.” Indeed, “a change-over from an increasing to a declining population” is what is happening today in the developed world, but is this going to be disastrous? Certainly a declining population implies a shrinking labor force and possibly a shrinking GDP, and – among developed countries – a shift in the balance of power in favor of North America as compared to Europe and Japan. From a geopolitical or geodemographic perspective, a declining population implies a loss of power and influence in the international arena. But one can legitimately argue that our central concern should be for individual wellbeing (with its imperfect proxy, GDP per person) rather than the “power” of a nation. The question has been discussed repeatedly in the decades since Keynes’ statement. Growth may slow down, or become negative, because the working-age population declines more rapidly than the total population. However, productivity need not be negatively affected because when labor becomes scarce, the system reacts by increasing investments in technology and human capital. On the other hand, activity rates may increase at all ages, and retirement from work may be postponed. If the labor force does not shrink, the number of immigrants can also be kept to a minimum. We may gain a clearer view of the question by taking a closer look at Germany, Europe’s powerhouse. With zero migration, between 2015 and 2050, the population of Germany would decline by 16%, while its working age population (20 to 64 years old) would fall by 24%. Let us assume that the activity rates, in each age group, increase to the level of the European country with the highest activity rates for that combination of age and gender (an increase, on average, of 6 points for men and 20 points for women). Let us also make the rather extreme assumption that 50% of men and women aged 65 to 80 years will be active in 2050, thus scraping the bottom of the barrel of native German human resources. Well, even in this extremely favorable perspective, the total active population in 2050 would be 4.5% lower than in 2015 – a modest decline, if compared with the 24% drop under the constant activity rates scenario, but still a decline, accompanied by ageing: in 2015, the proportion of the labor force above age 55 was slightly more than 20%, in 2050 it would be 35%. Let us now assume that the slight decline of the labor force depicted above has no influence on average individual wellbeing. Can the same be assumed for the process of aging? Is it possible that a 70-year-old additional worker can replace, with no loss of productivity, a missing 30 year old one? This is a central issue. From the point of view of mere physical efficiency, the health status of older persons has improved rapidly, while the incidence of disabilities, chronic pathologies, and the like has declined. On the other hand, the gradual shift from forms of labor involving physical, muscular effort to forms of labor requiring sophisticated intellectual abilities – typical of modern societies – makes aging a lesser obstacle to economic efficiency. Technology and education are the keys to the transition, in keeping with the process of dematerialization of production and consumption. Policies and institutions will sustain this process. So, why worry about aging? The problem is that notwithstanding the improved health status of older adults, empirical studies tend to confirm that individual job performance, or productivity, over the working life cycle, is shaped like an inverted bowl. It increases in the early part of the working cycle, it is flat for most of the cycle, and declines towards the end. The form of the bowl, the length of the flat platform, the steepness and timing of the decline vary according to a number of factors, such as the nature of the job, the worker’s physical and psychological fitness, the cognitive abilities required, and the working environment. The following is a quote from a review of the literature “An important cause of these age-related productivity declines is likely to be age-related reductions in cognitive abilities. Some abilities, such as perceptual speed, show relatively large decrements from a young age, while others, like verbal abilities, show only small changes throughout the working life. Experience boosts productivity up to a point, and thereafter additional tenure will have little effect. Older individuals learn at a slower pace and have reductions in their memory and reasoning abilities. In particular, senior workers are likely to have difficulties in adjusting to new ways of working.” (Skirbekk. 2008). In manufacturing, there is a wide consensus that young workers are significantly more productive than older workers, once the effects of the sectorial composition of production are held constant. Of course, this disparity can be reduced with the right policies, investment in human capital or technology. But it cannot be eliminated altogether. There is, however, another aspect to be taken into account. If productivity, for the majority of workers employed in manufacturing, agriculture or the tertiary sector, has the form of an inverted bowl, there are many other significant areas of human activity where the life cycle profile of productivity is heavily skewed to the left, with modal values at relatively young ages. In the hard sciences, the modal age of the “beautiful minds” at the invention or innovation that earned them a Nobel Prize or other prestigious recognition is between 35 and 40 years of age, with a frequency several times higher than at 60 or 70 years of age (Jones, 2010). This is often true in other fields – not only among artists but also among innovative entrepreneurs or initiators of successful startups. Quickness of mind, risk-taking, some homeopathic doses of arrogance, and rebelliousness are often a key to success and the salt of development. Summing up, there is little doubt that the process of aging represents a trade wind unfavorable to development. The problem is that in the 21st century the wind is blowing much stronger than in past times. Only up to a point can the unfavorable consequences of an aging and shrinking labor force be counteracted by more technology, richer human capital, and an improved social and working environment. Jones B.J. (2010) Age and great invention, The Review of Economics and Statistics, XCII, n. 1, February. Keynes J.M. (1937) Some economic consequences of a declining population, Eugenics Review, XXIX, n. 1. Sirbekk V. (2008) Age and Productivity Capacity: Descriptions, Causes and Policy Options, Ageing Horizons, n. 8, Oxford Institute of Ageing. United Nations (2015) World Population Prospects. The 2015 Revision. New York, NY.